I’m ready to get back in the kitchen after a much needed Spring holiday in New Mexico. I’ve been wanting to bake some bread and after cleaning out my refrigerator, I had enough space for a bucket of Artisan dough that I could use over the course of two weeks. The master recipe for “Artisan Bread in Five Minutes a Day” can be found online, and I’ve had the best results using their method. The chilled dough is easy to work with and you can use as much or as little dough needed for most any bread, whether it be a loaf, baguette, or rolls. I took half the chilled dough and made two baguettes which have a crusty exterior that is perfect to go alongside a stew or pasta dish. A couple days later I tried out some dinner rolls. They were more delicate than the baguettes but had a nice top crust to each roll. These were a favorite warmed with a dollop of butter and a bit of jam for breakfast. 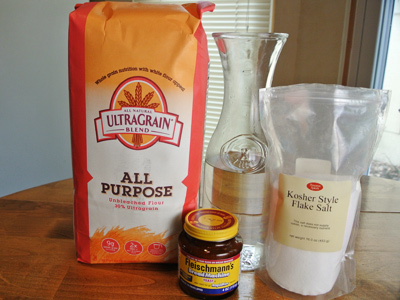 Only 4 ingredients; flour, water, yeast and kosher salt. You can make the bread by hand right in the 5 quart bucket, which I sometimes do, but today I’m going to use my stand mixer to make the job a little easier. Mix together the water, yeast and salt. I have found that the dough seems to rise better and faster if I let the yeast ferment a few minutes before adding the flour, however the “master recipe” mixes it all at once. Add part of the flour and begin stirring. 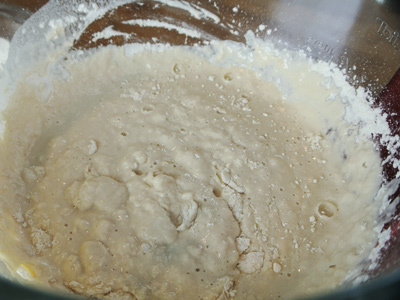 If you are using a stand mixer, use the dough hooks on low speed until the flour is incorporated, then add more flour. Mix on low until all the flour is incorporated. The dough will be sticky and you may need to flour you hands to transfer the dough to the bucket. The dough only fills about 1/4 of the bucket at first. Set the lid on top but do not snap tight. 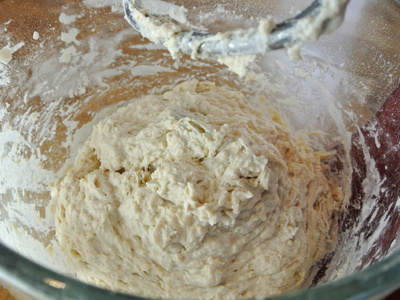 Allow the dough to rise at room temperature for 2 – 3 hours. 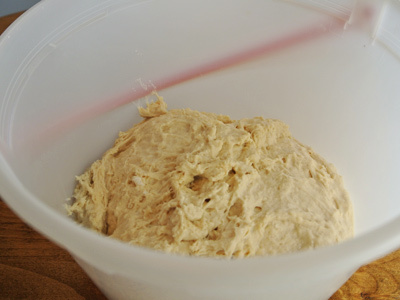 The dough should rise to the top of the bucket in 2 – 3 hours. At this point the dough is ready for the fridge. Do not punch down the dough. Secure the lid on and refrigerate. 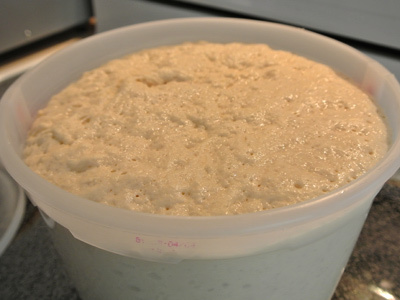 The yeast will continue to work even in the refrigerator and the dough will flatten over time. I chilled the dough overnight and it was fairly easy to pull the dough out onto my floured surface. You may notice that the dough has collapsed on it’s own which is normal. I will need one quarter of the dough to make each baguette. 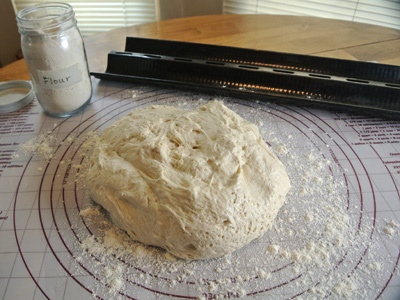 I lightly kneaded in the flour to make a smoother workable dough. I used my pastry cutter to divide into 4 pieces. I will use 3/4 of the dough for my baguettes and rolls and leave the rest for later. Don’t know what I will try next but I’ve got 2 weeks to decide. And the longer the dough sits in the fridge, the more it takes on a sourdough taste. 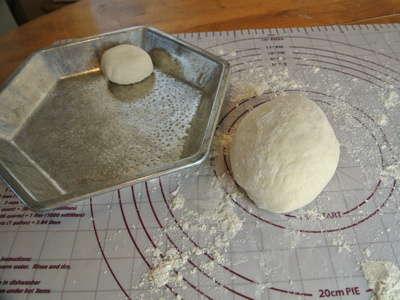 Take one piece of the dough and form into a oval shape. Begin rolling between your hands to form a rope like dough. When you have the dough to the length you desire, fold over the edges so that they lie on the bottom of the baguette. If using a baguette pan, lightly spray the pan with cooking spray and sprinkle cornmeal in the bottom of the pan. Preheat your oven to 450 degrees and set a pizza stone or cast iron griddle on the middle rack of the oven to heat. 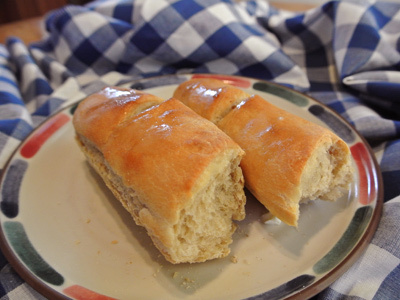 Lay the dough into the baguette pan and cover with a kitchen towel. I usually place it on top of the stove where it’s warm enough to rise. I found this baguette pan at a thrift shop in Albuquerque. I have been looking for one for the longest time and this one is perfect. It’s a bit older and well seasoned, better than anything I could have found new! You never know what you’ll find at a thrift store and at a bargain too! About 45 minutes to an hour the dough has doubled and looks almost ready to go. Normally I would use a sharp knife to cut slits into the dough but with the baguette pan it was easier to snip with kitchen scissors. Before you set your dough on the pizza stone or cast iron griddle, place a pan filled with water on the bottom rack of the oven. 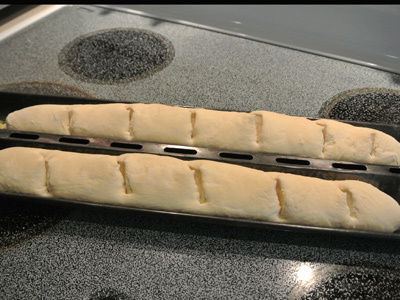 Set the baguette pan directly on the stone or griddle and bake for 18 – 20 minutes. 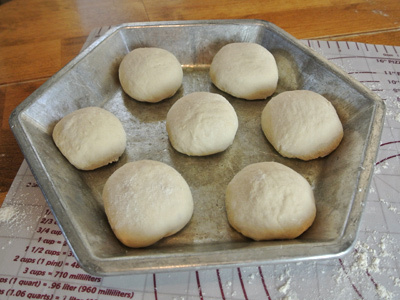 To make the dinner rolls, take a quarter of the dough (or half of the remaining dough) and divide into rolls. I made these about the size of a “Cutie” orange. Another thrift store find. Kat picked up this cute hexagon pie plate for 25 cents. I knew I could find something to use it for! Leave space between the rolls to allow for rising. Just like the baguettes, heat a pizza stone or cast iron griddle on the middle rack at 450 degrees. Cover and allow to rise in a warm area for 45 minutes. As you can see they have expanded to fit snugly together. Place a pan filled with water on the lowest rack in your oven. 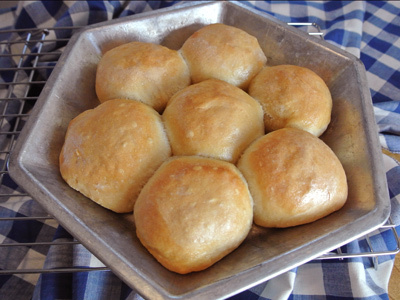 Place the pan with rolls directly on the stone or griddle for 18 – 20 minutes. Allow them to cool a few minutes in the pan. Don’t they look cute in the hexagon pan, like a pretty flower! So break off a piece of baguette . . .
or have a buttered dinner roll. . . You choose! 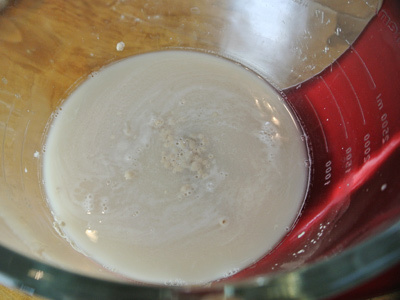 In a 5 quart bowl or bowl of a stand mixer, combine water, yeast and salt. Let the yeast begin to ferment, about 3 – 4 minutes. Begin adding flour and mixing either by hand or low speed of a mixer using the dough hook. When the flour has been incorporated, begin adding more until you have used all of the flour. 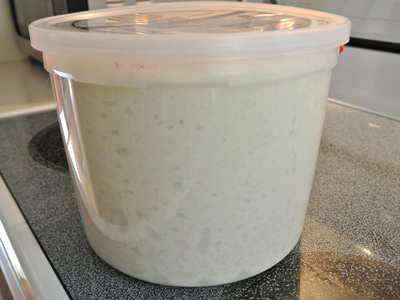 Transfer dough to a 5 quart bucket (ice cream buckets work well here) and place the lid over top but do not snap shut. 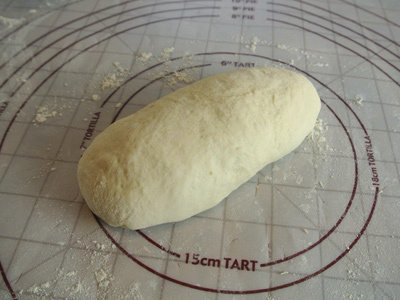 Allow the dough to rise at room temperature for 2 – 3 hours. The dough should rise to the top of the bucket. Do not punch down the dough, just let it settle by itself. Refrigerate dough to be used over the next 2 weeks. Preheat oven to 450 degrees. Preheat a pizza stone or cast iron griddle on the middle rack of the oven. Place a pan filled with water on the lowest rack of the oven. On a lightly floured surface take 1/4 of the dough (for each baguette) and knead into an oval shape on a lightly floured surface. 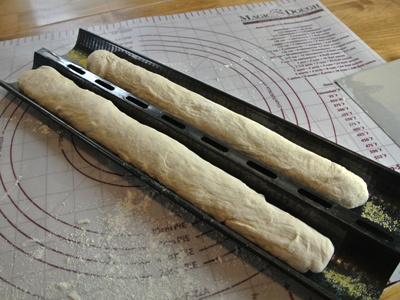 Begin rolling the dough between your hands like a rope until you have 15 to 18 inches in length. Fold the edges over to tuck underneath the dough. Place on a greased baguette pan or pizza peel. Cover and set in a warm place to rise (about 45 minutes to 1 hour). 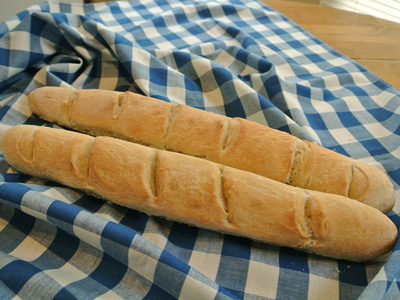 Cut crosswise slits across the baguettes with a sharp knife or with kitchen scissors. If using a baguette pan, place directly onto the hot stone or griddle, otherwise slide the raised bread directly onto the stone or griddle. Bake for 18 – 20 minutes. Let dough cool slightly before removing baguette. Preheat oven to 450 degrees. Preheat a pizza stone or cast iron griddle on the middle rack of the oven. Place a pan filled with water on the lowest rack of the oven. On a lightly floured surface take 1/4 of the dough and lightly knead. 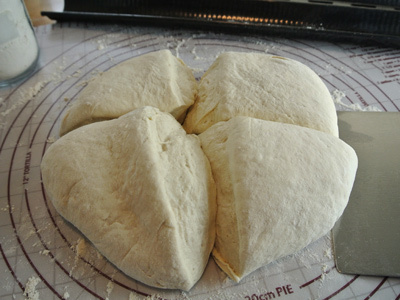 Divide the dough into 7 – 8 pieces. Shape each piece into a roll (slightly larger than golf ball size) and place on a lightly greased pie plate, making sure to leave some space around each roll. 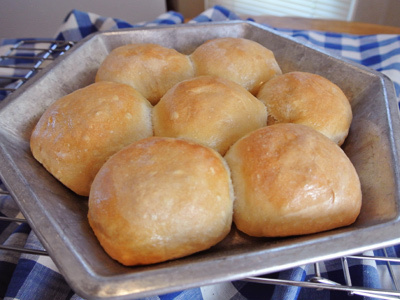 This allows for the rolls to rise and expand. 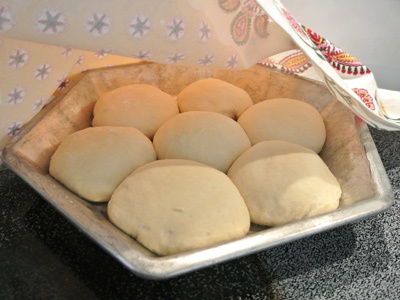 Cover rolls and set in a warm place to rise (about 45 minutes to 1 hour). Place pan directly onto the hot stone or griddle for 18 – 20 minutes. This looks amazing Jan! 🙂 Was the kneading minimal? I’m afraid to bake anything that requires kneading –I always screw it up. The chilled dough is much easier to work with. Not so much kneading, but rather shaping the dough. A lightly floured surface and floured hands are the key to working wet dough. Don’t give up, I’ve had my share of failed bread stories!